Just 2,013 new UK £5 Silver Coronation Coins have today been released as part of an exclusive Proof Coin Collection issued by The Royal Mint. Struck in 925/1000 Sterling Silver to an immaculate proof finish, the £5 Coronation Crown marks the most important Royal event of 2013. Emma Noble’s exquisite St Edward’s Crown design recalls the moment almost sixty years ago when the young princess Elizabeth, watched by millions, was officially crowned Queen in Westminster Abbey. Alongside the £5 Silver Coronation Coin, the other eight coins in the new Coronation Jubilee Executive Proof Set – the 1p, 2p, 5p, 10p, 20p, 50p, £1 and £2 – are newly dated 2013 coins in their original circulating metal. That’s not to say these are the exact same coins you’ll find in your change – every single one has been finished to the highest possible proof standard. 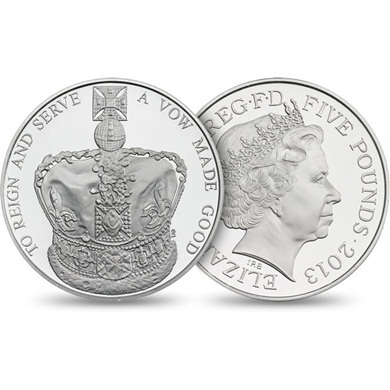 New limited edition set features the new £5 Silver Coronation Coin as its centrepiece. With just 2,013 Silver Coronation Coins released today, demand to own the new Coronation Proof Set is sure to be high. Please click here for a selection of Coronation coins available.